Why Is My Cat So Skinny? It can be difficult to determine what a “normal” weight for a cat should be due to varying breed specifications; however, if you can see your cat’s ribs or hip bones he is probably too thin. There are many reasons which could be causing your feline to be underweight. Read on to discover some of the common issues to help you answer the question of, ‘why is my cat so skinny?’ Also read our article on how to fatten up a cat for tips on putting some weight on the kitty. Cats are known to be finicky, especially when it comes to their dietary choices. One day they will gobble up their food, while the next day they may leave us pet parents scratching our heads while we watch Kitty turn her nose up in disdain. Sure, a change in food could be the culprit, but sometimes your cat’s fussiness could simply be due to its propensity to eat out of a freshly cleaned dish. Before each meal, especially is wet food is involved, give your cat’s dish a quick rinse to remove any old stuck on food. This may be all it takes to give Kitty back her appetite. In addition, the ASPCA recommends never putting your cat’s food and water dish near the litter box. We most likely wouldn’t want to eat near a bathroom and neither do our cats. 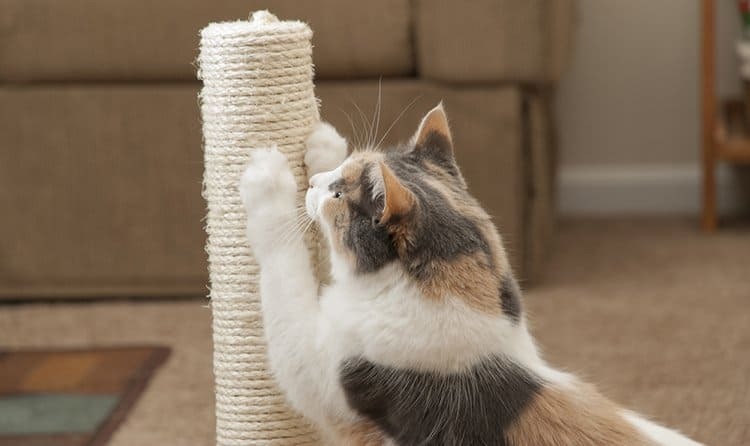 If there’s been a lot of commotion in your home or the addition of a new family member (animal or human) this could be affecting your cat’s stress levels. If this describes your situation, be sure to give your furbaby a private place to unwind and to eat without interruption. Cats can also develop anorexia (refusal to eat). But unlike the human condition that is usually started by a body-image issue, cats can become anorexic due to underlying health issues such as diabetes, kidney disease, hyperthyroidism or even asthma. If you think your cat may be suffering from any of these conditions, be sure to seek veterinary attention. If you’ve recently changed your cat’s food or she has gotten into something she shouldn’t have, these can lead to gastrointestinal upset, which is usually accompanied by vomiting and/or diarrhea. However, if everything has been fine with Kitty’s appetite and she’s still dropping those pounds, she may have a case of intestinal parasites. This can include the commonly found roundworm or even a tapeworm. Both of these parasites will require you to bring a fresh stool sample to your veterinarian for testing (see our article on the cost to deworm a cat). If worms are present, your cat will be given a medication to rid her body of these nutrient-sucking parasites. If you’ve ever had a toothache then you know how difficult it is to eat or to even muster up an appetite. Cats that develop gum or teeth issues will refuse to eat, plus they may be drooling and rubbing at their mouth area. Take Kitty to the vet to see if there is a tooth-issue that needs to be taken care of. Just like some senior humans, as cats age their appetites can change. This may be due to a decrease in their sense of smell, dental issues or the lack of movement which results in a lower caloric intake. Some senior cats can also suffer from constipation making it more difficult to have an appetite. Talk with your veterinarian about having your senior cat checked over for health issues and perhaps a change in his diet. A steady decline in your cat’s weight could mean there is a serious health issue like cancer. The best thing you can do is catch this ailment early and follow a treatment plan laid out by your cat’s vet. If you’re not sure if your cat is underweight, it’s always best to err on the side of caution and visit your veterinarian for a diagnosis and a plan to get Kitty back on track. Her skinniness could be rectified as easily as a dietary change, but if there is something more serious going on, it’s always best to have caught it early.